D. J. Elliott Simulation Lab presentation to the family at Belmont University in Nashville, Tenn. February 15, 2017. 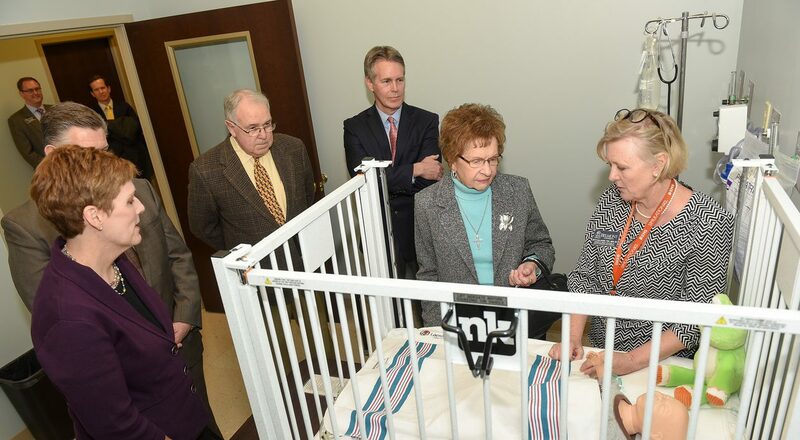 In a ceremony held last semester, Belmont’s College of Health Sciences and Nursing named its pediatric/obstetric simulation lab in honor of one of the college’s benefactors, the late J.D. Elliott. Elliott served as the founding president of the Memorial Foundation, which has donated more than $2 million to Belmont University over the past 20 years, almost all of which has gone to support health science and nursing education. In 2013, the Foundation granted Belmont $217,000 to renovate the lab space, purchase a new simulation Sim Mom manikin and update the lab’s simulation equipment. Mr. Elliott’s wife Anita, along with his daughter and son-in-law, Juanita and Jeff Stewart, attended the naming ceremony which included a reception and brief demonstration of the lab. Several guests from The Memorial Foundation also attended the event, including Foundation President Scott Perry and Foundation Board Member Drew Maddux, who also serves on the Belmont University Board of Trustees. The Memorial Foundation’s mission is to improve the quality of life for people through support to nonprofit organizations. The Memorial Foundation responds to diverse community needs, assisting agencies that focus on: Access to Quality Health Care Services, Human & Social Services, Education, Senior Citizen Enrichment Services, Youth and Childhood Development, Substance Abuse Programs, and Community Services.